Well I guess that about does it. My extended holiday will soon become a pleasant memory. By the middle of next week I’ll be trying to cajole, beg and plead with my students to get back into a school frame of mind. I expect it will take a solid two weeks or so before they are back up to speed. It may take me even longer. I have to say, the last five weeks have been, collectively, the best time I’ve had so far in my adopted homeland. If you missed it you can check out a couple of the highlights here and here. I got a lot of rest, saw a lot of people, met some new friends, took a ton of photographs and made a little cash along the way. In addition, I was able to spend a LOT of time experimenting with Photoshop. I’ve really been wanting to improve my digital darkroom skills but I never seem to be able to find enough time to sit down and play with sliders all day. F0r many of us Photoshop can be a bit daunting. at first . In reality you can find most anything (tutorials) on the internet these days IF you have enough time. I finally had enough time. One of the things I played around with is a process called tilt-shift miniature faking. Miniature faking is a post-processing technique which involves selectively blurring a photo to simulate the narrow depth of field found in macro photography and some tilt-shift photography, making the image appear to be of a miniature model. I found many tutorials on-line about how to achieve “the look” but I think this one was the best. The content is succinct with everything y0u need to know while being not difficult to follow, perfect for the likes of me. Miniature models are usually viewed from above so if you choose a photo with an elevated viewpoint and a reasonably wide angle of view you should get some interesting results. Saturation junkies should enjoy this process as well, since pumping up the color usually only adds to the miniature model effect. 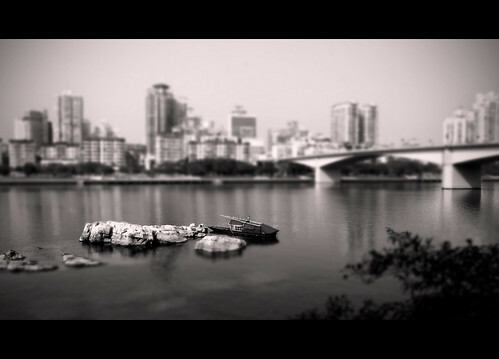 This first shot was taken in my neighborhood in the Gu Bu Jie section of Liuzhou. Of course there are exceptions to every rule and being the rebel rousing rule-breaker I am, I tried the effect on some not so typical shots as well. While this one wasn’t taken from much of an elevated viewpoint, it’s still relatively wide at 20mm on the 1.6 crop of the Canon 40D. I decided to combine some black and white conversions on a few shots and quite like the resulting image here of life on the Liujiang River. 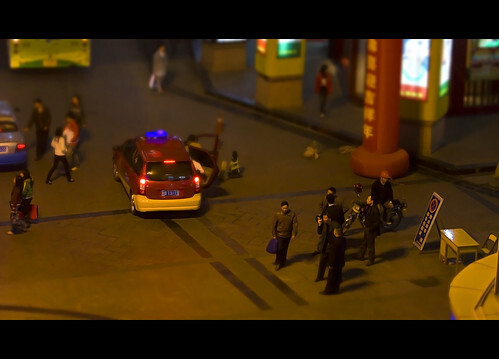 You can see some more of my first attempts at tilt-shift miniature fakes here. Over the past five weeks I also played around with processing techniques like gradient mapping and layers. While I was already familiar with those techniques results had always been hit or miss, usually taking a lot of time to get the desired results. I trolled the internet for Photoshop plug-ins and actions and realized that with a little time and patience, I could easily fine tune images to a wide array of styles in order to evoke a certain mood or feeling. After a few trial runs, the time spent on processing was cut dramatically. Just go to your favorite search engine, type in “Photoshop” + “actions” or “plug-ins” or “tutorials” and you will find more direction than you probably have time for. Here are some of the resulting images. This first one was achieved by using a combination of gradient mapping and another photoshop action called Midnight Sepia. You can find a set of three of Dave Jaseck’s Midnight Actions here. Very cool effects to play around with. This next shot began with a simple level adjustment and evolved. In the end, there was some cross-processing and gradient mapping as well as some lighting filters. This was solely an attempt to make a rather dull image “pop”. I wouldn’t enhance a photo like this for journalistic use but sometimes it’s fun to push it a little to see what happens. This old cat is quite a character. He’s a blind busker and sings on the Liujiang Bridge nearly every day in all kinds of weather. I am pretty sure he is homeless. The noise he’s making is just terrible, something akin to an old cat in heat. Over time I have asked three different people what he is singing about but no one seems to be able to understand the guy. I give him some money from time to time and I’ve tried to ask him a few questions but he never responds, just keeps on singing. It’s possible of course that my Chinese is so bad he can’t understand me. The last two times I tried he did at least manage a smile before turning up the volume. If anyone has specific questions about how to achieve any of the effects you see here, leave me a message in the comments section and I’ll do my best to point you in the right direction. I imagine I won’t be posting quite as voraciously over the next few weeks as I ease back into campus life. I do expect to get the first in a series of interviews with some amazing Chinese based photographers up soon. ~ by Expatriate Games on February 23, 2009. Love the tilt-shift miniatures. Nice work. Thanks for stopping in Chris. I just took a peak at your blog, wonderful photography. I almost want to go back to film after looking at your stuff. Almost! Love that first tilt-shift image. The tutorial you linked to is the same one I use – I say use because I do it so rarely that I always forget the steps and need to go back to the tutorial each time. Looks like you’ve really gained a lot of skill! Love the model shots, but also the singer. What a gnarly face. That tilt photo is great! I have to try that tilt shift tutorial. I read about it elsewhere. It looks very interesting. Yeah Stevo, getting past the frustration IS the hard part for me too. It never fails, once I actually make the time to learn a new technique I laugh at myself for putting it off for so long because it’s never as difficult as I want to make it out to be! Looks like you enjoyed yourself with this Photoshop stuff. That first one is amazing, can’t get over the fact that it is a real life picture. To me it is abracadabra. IrfanView is as adventurous as I get. Sorry to hear your vacation time is over, really enjoyed checking in and finding new posts. But I am looking forward to those interviews. Thanks Peet, I am looking forward to the interviews too! Only problem is getting the first one edited and posted! Time, IS NOT, on my side! Just passing by. Great website! Great photoshop work. How did you get the effect on “The Singer”? Gamut, The Singer was an effort to make an underexposed back-lit photo something viewable. It was rather blah out of the camera but I liked his intensity and the fact he was so in the moment. I tweaked the levels, increasing the contrast quite a bit and then used a gradient fill layer with a splash of orange and purples (I think). The vignette was pretty much already there. I used a spotlight filter and I ran it through the poster edge filter at it’s lowest levels. Hope that helps! I saw the picture before I read the text, and that miniature photo really threw me off. Nice effect. Thanks Clark, I took a quick look at your blog, I’ll get over there again soon and take some time reading through your posts!